Patina Stains are blended to match chemical or traditional patinas, but are easier to apply and manage. They are UV stable. These stains may be sprayed, brushed, or rubbed on any metal. They may be thinned to produce a lighter shade. 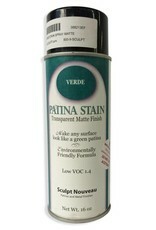 One gallon of Patina Stain covers approximately 300 sq/ft. For best results, over-spray with Clear Guard after application. The stains are available in verde (copper green), black (looks like gun bluing or PC9), and brown (oil rubbed bronze). They are available in normal and environmentally friendly formulas. The environmentally friendly formula has lower VOC, no solvent odor, and may be thinned with Clear Guard EF or acetone. 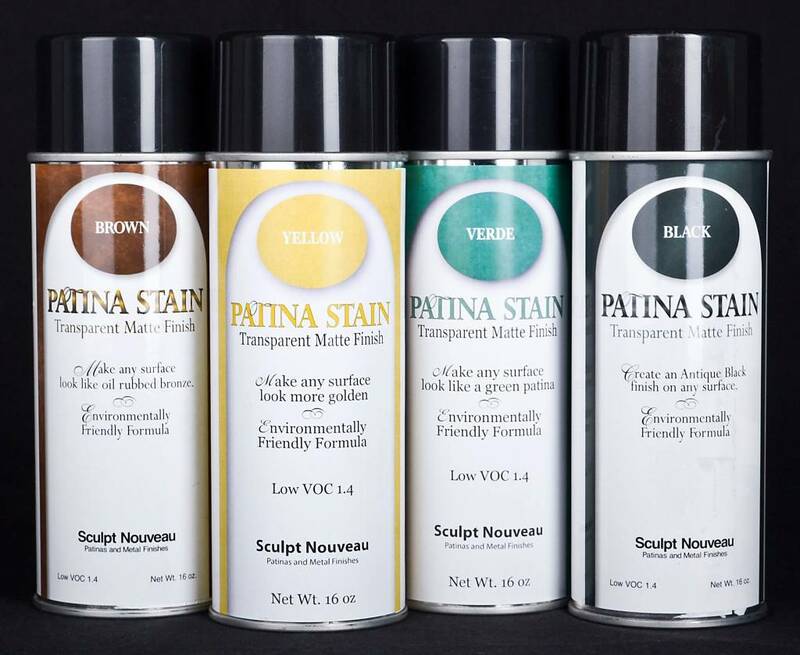 The environmentally friendly black, brown, and verde Patina Stains are also available in 12oz. spray cans. Spray cans are only shipped by ground. Patina Stain Application Instructions: 1. Clean metal with IMS Metal Cleaner. 2. Dilute the Patina Stain 1 to 1 with Xylene (Xylol). If the EF Patina Stain is used, thin with acetone instead. 3. For the most even and clean distribution, apply the Patina Stain with an airbrush or other spray equipment. 4. With a cloth, wipe the surface with thinner to leave the Patina Stain in the recessed areas. Alternatively, Black Wax may be used to darken the recessed areas.